So you are thinking about selling your home yourself and don't want to use a Realtor because you would like to save the commission expense. In order to help you better understand what you are up against, here are some statistics you may want to consider. According to the most recent report by the National Association of Realtors - FSBOs (For Sale by Owner) accounted for only 8% of home sales and the typical FSBO home sold for $190,000 compared to $249,000 for agent-assisted home sales (NAR 2017 Profile of Home Buyers Report). Yes, that is right, the numbers show that you are more likely to lose money selling the home yourself than you would save on the Realtor's commission. But you say, I am willing to pay a buyers agent, so that will help right? Being willing to pay a Buyers Agent commission is great first step and a good decision. However, by not hiring a Realtor to represent you, you are only saving the Listing Agent's commission (usually 3% to 3.5%) and you are essentially paying a Buyers Agent to negotiate against you, increasing the chance that you will not get the maximum sale price for your home. 1) 88% of buyers use a Real Estate Agent or Realtor. Why? Because the average buyer wants the Realtor to help find the right property as well as provide insight into neighborhoods, schools, market information and more. Realtors often help buyers with finding a mortgage broker or other professionals such as Real Estate Inspectors. As a Seller it is in your best interest to use a Realtor in order to get access to those buyers as well as take advantage of a Realtors expertise and community connections. 2) Getting the right price: 15% of FSBO sellers struggle with pricing their home correctly (NAR 2017 report). By hiring a Realtor to list and sell your home, you can expect a Realtor to do a comprehensive property analysis and evaluation designed to determine market value. Believe it or not, Sellers can under price their home as often as overprice, so it pays to have an expert provide you with a competitive price analysis. It is also important to keep in mind that overpriced homes sit on the market costing you money each month in extra mortgage payments, insurance, etc. A quick sale at a fair price is the best option for any homeowner. 3) Pre-qualified Buyers: One of the greatest benefits of hiring a Realtor to sell your home, is your Realtor will pre-qualify buyers so that you do not waste your time with people who cannot afford to buy your home or do not have the credit score to qualify for a mortgage. Part of a Seller's Real Estate Agents job is to make sure that the Buyers looking at your home are able to purchase it, either by directly qualifying the buyer themselves or by requiring proof of qualification from a Buyers Agent. 4) Safety: When you sell your home yourself, keep in mind that the people you are letting into your home are strangers. The last thing you want is someone pretending to be a Buyer and viewing your property with the intent to burglarize or otherwise harm you. A Realtor builds relationships with the Buyers they work with as well as other Realtors representing Buyers, and have an obligation to look out for you and your home. 5) Marketing: Realtors have experience marketing properties to both Buyers and Buyer's Agents. Not only will you benefit from your home being listed on the MLS but also from signs, flyers, mailings, open houses, advertising and more. Bottom line, marketing and advertising is expensive and by hiring a Listing Agent, you will not be out of pocket for those costs. Marketing is also time consuming and unless you are a professional Marketer, it may not make sense for you to do this task yourself. 7) The Paperwork: 12% of FSBO Home Owners say that they have trouble understanding and performing paperwork requirements. Unless you are an Attorney, or someone who is comfortable with legal documents and contracts, you may want to consider having a Realtor sell your home for you. The piece of mind of being able to rely on a Real Estate Agent for expert advice on preparing paperwork is well worth it. 8 ) Negotiation: The sale of your home is one of the largest financial transactions you will ever undertake. Representing yourself as a FSBO is a huge financial risk if you do not have experience selling Real Estate. A Realtor is an expert negotiator with the ability to deal with a Buyer and Buyer's Agent without emotion and with skill. Realtors will often bring solutions to the negotiation table that you have not thought of and can argue on your behalf in ways you may not be able to do yourself. This is especially true when dealing with Realtor to Realtor negotiations. 9) Liability: Providing Disclosures to the Buyer is a requirement of a Real Estate transaction. 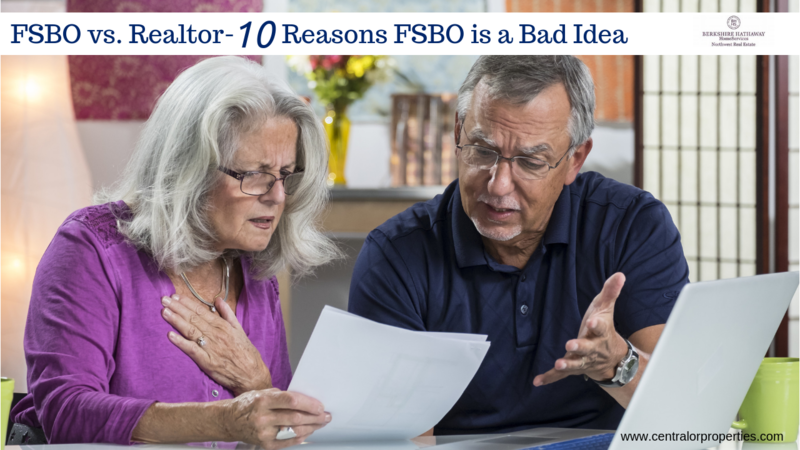 As a FSBO you need to be aware of your legal responsibilities as a seller and you need to provide disclosure documents to the Buyer as a condition of sale. A Realtor has experience with these documents and can answer questions as well as guide you on the proper timing of disclosure and what to do if there are problems with a transaction.